India Delights, as the name suggests is an Indian restaurant in Forest Hill, across the street from Forest Hill Chase Shopping Centre. I head one of the chefs here was from another Indian restaurant in Knoxfield (or around there) who has established this one recently. 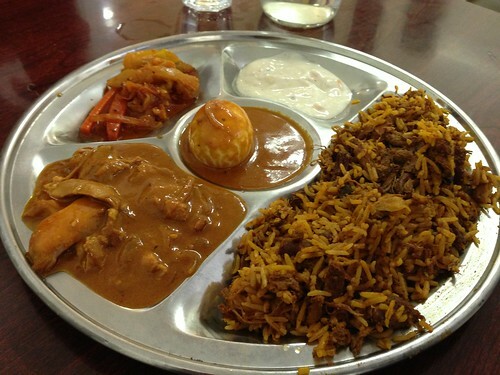 The food at India Delights is predominantly Indian (duh) but the food also has its Malaysian influences. It’s Mamak (Indian/Malaysian) but I feel it leans more heavily on its Indian ingredients as opposed. Their Chicken Briyani as pictured above is quite tasty, the flavours of the rice are beautiful and taste as a Briyani should, plentiful of spices, and meat. The curry isn’t too bad either but it definitely tastes like your standard Indian curry (and spicy too). I prefer ChilliPadi’s Briyani to be honest and Taste of Singapore’s Briyani, but this would be a close third. Indian Rojak is one of those dishes you hardly see, but nonetheless it is a treat to order. It’s basically an assortment of vegetables/salad ingredients with crispy friend potatoes and tofu mixed with a spicy gravy. 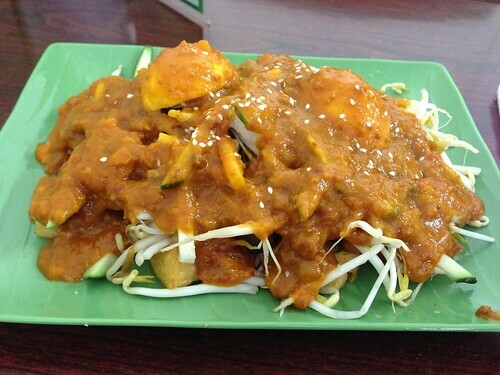 My mother swears this is one of the tastier Indian Rojak’s around, better than ChilliPadi’s. Her stamp of approval is extremely hard to get (haha) and I find it it be quite great too. The gravy has a nice hint of spice that tingles on your tongue but doesn’t overtake the taste of the other ingredients. Very complementary. I ordered their Lamb Murtabak and it certainly is on the thick side of things, packed full of lamb and onions. I found the bread to be too soft, I prefer my Murtabak to be crispy on the bite but here it feels like roti that hasn’t been toasted. It’s probably because it’s difficult to get the balance of crispiness right with the inside cooked well but I’m unsure. The curry also isn’t too bad, I felt it uses too many spices that doesn’t sit right with me. Some might prefer this kind of curry but I like the creamier varieties with the spices toned down. 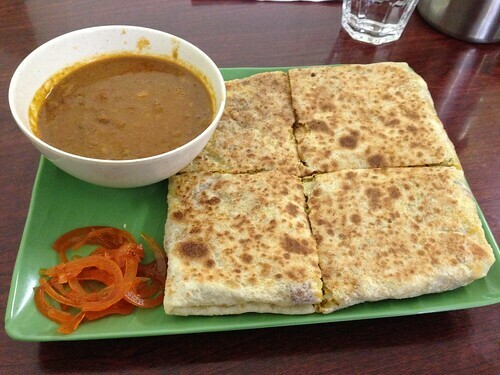 Overall it’s a decent dish, and quite filling at that, but Taste of Singapore’s Murtabak has it beat. Unsurprisingly, Indian Delights is quite popular with Malaysians and Singaporeans. During lunch time, that’s all you see eating there! I actually haven’t seen Indian diners there. The food here as indicated above is more Indian influenced as opposed to Malaysian/Indian but that’s not a bad thing. A bit of variety is always welcomed. I don’t know if it’s my go to place for Mamak cuisine, however the food here served is overall quite good so on occasion I might venture down there again.